One of the more advanced things you can do with Adobe Analytics is to track click-through rates of elements on your web pages. 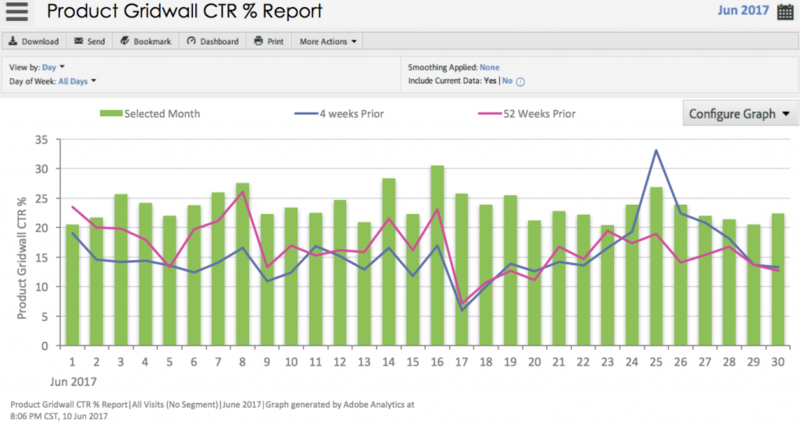 Adobe Analytics doesn’t do this out of the box, but if you know how to use the tool, there are some creative ways that you can add click-through rate tracking to your implementation. In this post, I will share a few different ways to track click-throughs for both products and non-product items. 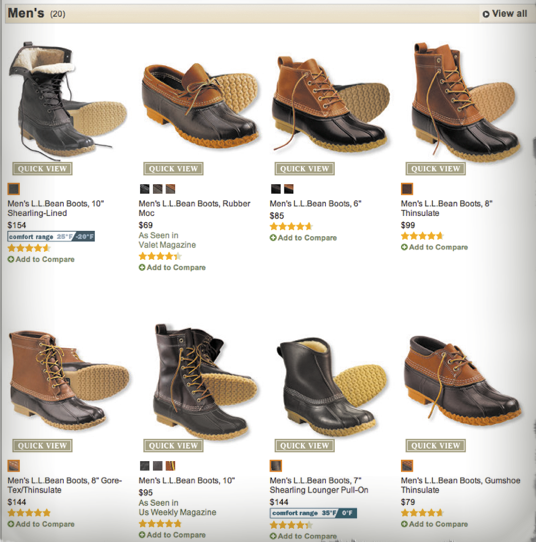 There may be times that you want to see click-through rates for things that are not products. Some examples might include internal website promotions, news story links on a home page or any other important links on key pages. In these cases, you could use the previously described Products variable approach, I don’t recommend it. Using the Products variable for these non-product items would result in many (hundreds or thousands) of non-product values being passed to the Products variable, which is not ideal. It is best if you keep your Products variable for products so you don’t confuse your users. When I ask Adobe Analytics power users in my Adobe Analytics “Top Gun” class how they would track click-through rates, the most frequent response I get (after the Products variable) is to use a List Var. For those unfamiliar, a List Var is an eVar that can collect multiple values when they are passed in with a delimiter, similarly to how the Products variable is used. On the surface, it makes sense that you can follow the same approach outlined above using a List Var, but unfortunately, this is not always the case. To illustrate why, I will use an example from a company that faced this problem and used a creative solution to it. Ferguson is a plumbing supplies company that displays its main product categories on the home page. They wanted to see the click-through rate of each, but this got complicated because once a visitor clicked on one of the categories, they were taken to a page that had product sub-categories and they also wanted to see impressions of those! So, on the first page, they wanted impressions and then on the second page they wanted to capture the click of the item from the first page, but at the same time capture impressions for more items on the second page! This illustrates why the List Var is not always good for tracking click-through rates. If they were to try and use a List Var, we could easily track impressions on the first page, but what would we do on the second page? It isn’t possible to tell the same List var to collect the ID of the item clicked on the first page AND the list of items getting impressions on the second page. If you passed all of items at the same time, the success events you set (Clicks and Impressions) would be attributed to both and all of your data would be wrong! You could use multiple List Vars, but then you’d have to use two different reports to see impressions and clicks, which makes things very difficult and time consuming. You could also fire off extra server calls when things are clicked, but that can get really expensive! 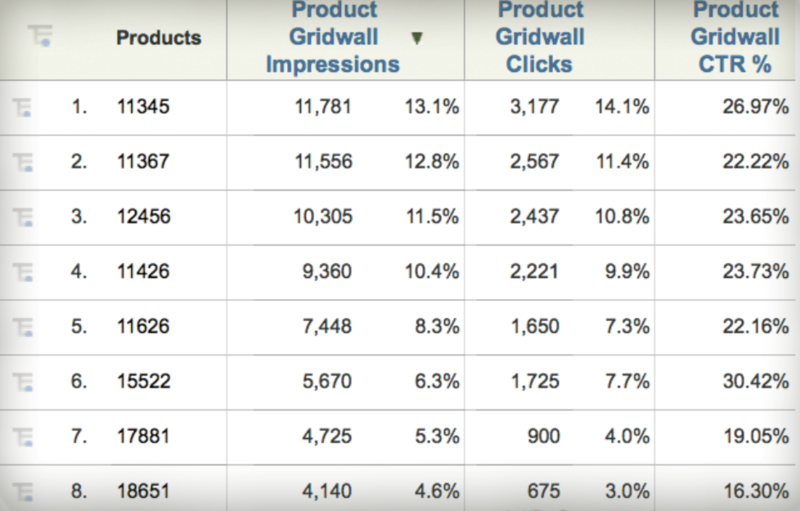 Therefore, my rule of thumb is that if you want to see impressions and clicks of products, use the Products variable and if you want to see impressions and clicks for non-product items, only use a List Var if there are no items on the page visitors get to after clicking that require impressions themselves. But what if you do want impressions on the subsequent page like Ferguson did? This is where you have to be a bit more advanced in your use of Adobe Analytics as I will explain next. The following gets a bit complex, so if you aren’t an Adobe Analytics expert, be forewarned that your head might spin a bit! As mentioned above, you have solved 2/3 of your impression and click tracking problems – products and non-products where there are no impressions on the subsequent page. Now you are left with the situation that Ferguson faced when they had impressions on both pages. To solve this, you have to use the Product Merchandising feature of Adobe Analytics. This is because you need to find a way to assign impression events and click events on the same page, which means you need to set your success events in the product string so you can be very deliberate about which items get impressions and which get clicks. However, as I started earlier, you don’t want to pass hundreds of non-product items to the Products variable, but you cannot use Merchandising without setting products (I warned you this was advanced stuff!). While this looks pretty intimidating, if you break it down into its parts, it isn’t that bad. First, you will see that a “fake” product named “int_cmp_imp” is being passed to the Products variable once for each item that gets an impression. This means that instead of hundreds of products being added, only one is added to the Products report. Next, in the success event slot of the Products string, you will see that event40 is being incremented by 1 for each item receiving an impression. Next you will see that the actual item receiving the impression is captured in a product syntax merchandising eVar18. For example, the first one captured is “mrch_hh_kob_builder” (you can put whatever values you want here). Then the same approach is repeated once for every item receiving an impression on the page. By setting event40 and eVar18 together, each eVar18 value will increase by one impression upon page load (note: that the “fake” product will receive impressions as well, but we probably will just disregard that). Notice here that the beginning of this string is exactly the same as the first page with the “fake” product of “int_cmp_imp” being set for each item as well as the impression event40 and the item description in eVar18. The key difference here is highlighted in red in which a new product is set “int_cmp_clk” and a new click event41 is incremented by 1 at the same time as eVar18 is set to the item that was clicked on the previous page. The beauty of using the Products variable and Product Merchandising is that you can set both impressions and clicks in the same in the same Products string, while at the same time only adding two new products to the overall Products report. By using a combination of success events, the Products variable and, in some cases, Product Merchandising, it is possible to see how often specific items receive impressions, clicks and the resulting click-through rate. There may be some cases in which you have a large number of items for which you want to see impressions and clicks and in those cases, I suggest checking with Adobe Client Care on any limitations you may run into and, as always, be cognizant of how tagging can impact page load speeds. But if you have specific items for which you have always wanted to see click-through rates, feel free to try out one of the techniques described above. Thanks Adam for sharing the solution for such complex case with Advance warning 😀 . Noob question, why did you use fake variable even though later on you passed actual variable name on same product strings? Is it bcz the variable was of no use for slice/dice and variable name would be consistent int_cmp_imp/int_cmp_clk in the implementation ? I just read ur blog ‘merchandise var’, and saw this ‘Product you pass will be forever tied to the Category in that string’ . Is that the reason you used fake var name for catagory? Merchandising doesn’t work unless the Products variable is set. That is why you use a fake product. No Category value is passed in this example (left blank) as it is not needed. Hey Adam, how do you handle pixel truncation here? The products variable might not have size limitations but some of them look like they would crush IE’s 2083 character limit. Good question. Josh tells me this: If you use app measurement, Adobe sends the request differently when it’s more than 2000 characters. And the newer versions of IE don’t have the problem, either. Yep, app measurement will move over to a POST instead of a GET request for long URL’s. That gets around browser url limitations. I’m facing exactly the same problem of Ferguson. My actual solution for PFM tracking is using one list var for impression and one eVar for click. 2) Firing an impression event for each product will increase a lot my total impression. Today my number of impressions is equal to the pageviews of the page. Using s.products + conversion event syntax, the number of impressions will be multiplied by the number of products presents on the page. I think I can use an “Record once per visit” event but it will change the baseline of the CTR metric. Do you’ve ideas for this 2 topics? On your first point, this technique is only to see impressions and clicks and not to see the downstream impact of one of the items clicked. To do that, I suggest that you set a normal eVar (like you would for internal campaigns) when visitors click on an item in addition to what is set in the products string. On your second point, you would never look at clicks over impressions outside of the Products variable (or merchandising eVar is using the Ferguson approach), because it wouldn’t make sense. The goal of those events in this scenario is to see for each item impressed, how many clicks took place. I guess if you wanted to see the click-through rate of these items, you could do some sort of serialized success event (above and beyond what is shown here), but you cannot use Record Once per Visit, but rather, would have to use manual serialization, otherwise, it would only work for the first page visitors saw with impressions and clicks. I think we’ll have to look into this a little more on our side. We are using AppMeasurement but I’m still seeing that 99% + of our truncated pixels are microsoft browsers (including edge 14 & 15). Hi Adam, thx for your answer. Regarding the first topic, I’m planning to store the product id + grid click informations on a cookie or session storage to enable the transaction reports. This way I’ll be able to see everything using the same variable. Thx for the tip on the second topic. I have a very basic question Adam. When do you pass the server call for impressions. Example on a page load there are 10 products which visitor can see and as he scrolls down more products will come up automatically and he can keep scrolling down and see a whole lot of products, let’s say 1000 for this case. So my question here is when do you pass the Analytics server call for the products impressions? If I pass it for every product then my server calls will increase manifold. So what condition to use for creating a rule for impressions keeping in mind the number of server calls, s.products character limitations and capturing all impressions? Thanks Adam. I was just looking for some best practices. Another great read @Adam Greco! Thanks for sharing some of the knowledge! thanks for the great read and sharing your knowledge. We tested this and came to the conclusion that in order for this to work the event40 and event41 (as in your case) need to be configured as numeric events. In addition these events the need to be set in the events variable. Is there a way of using a counter variable in a products incrementer?